THANKS TO COACH HALE & COACH GRAY! 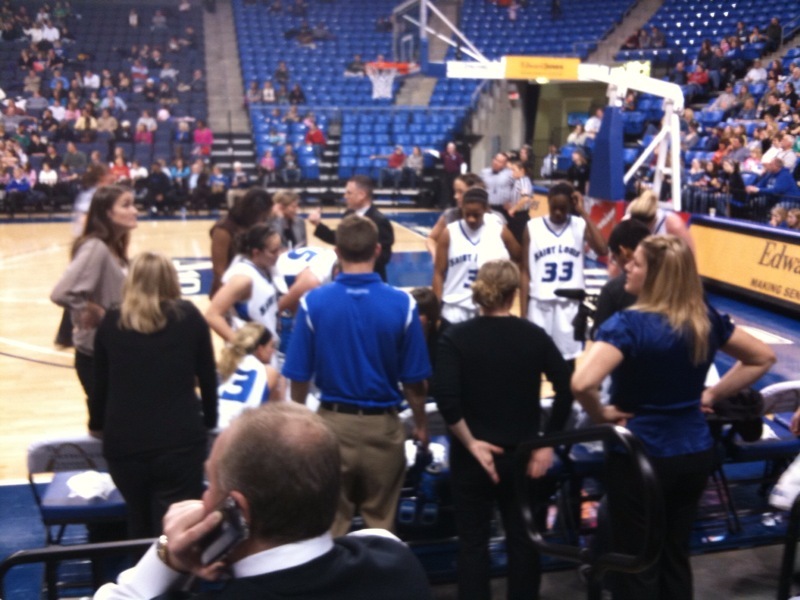 Tonight I was honored to be the guest Coach for the Saint Louis University Lady Billikins who are in Division I Atlantic 10 Conference. We played Rhode Island which was undefeated in our conference this year and we won 64-50—BEARY exciting!! Last year I met Coach Shimmy Gray and one of her players Lauren Woods and we bonded. While I am just 4’10” I have always loved to play basketball and also enjoyed being a spectator. I especially love college basketball and women’s basketball is even better! To see these amazing young women, so bright, beautiful and athletic compete is a thrill. Thank goodness for Title IX and all the benefits of equal access to sports for female athletes. People are often surprised to hear I am such a basketball nut—well they have Coach Bruce Hale to thank for that. I grew up in Miami, Florida right next door to the basketball coach of the University of Miami. In those days there was no college basketball for women. Coach Hale was an outstanding coach on the court and off as ne mentored and encouraged his players to make the most of their academic and athletic life as a Miami Hurricane player. In his spare time he coached us neighborhood kids –girls and boys. Little did I know that the way he motivated us was by starting the net down low enough for us to be successful and then little by little raising it so we were never intimated by how far away it looked! Once you get used to the high of winning, it is addictive and you keep pressing on. That is how I have looked at goals ever since—not as intimidating but as a challenge and absolutely not out of reach with the proper level of practice! In September Doris Hale (the Coach’s wife) was in town to celebrate her 90th birthday with my husband and me. On Sunday during her visit we went to SLU to see the Lady Billikins work out and get a tour of their facility. We had a great time. She too had a love for basketball as she was a high school player in San Francisco at Galileo High School in 1935. I called her tonight to tell her I had won one for Coach Hale ! Finally, I got to “play” college ball. I know Coach Hale was looking down on me and my team and cheering us on—after all he was the one who gave me my nickname—Tickety Taxi because I was always fast on the court. Thanks Coach Hale for all you taught me about sportsmanship, setting goals and hard work. Those principles have never let me down. Thank you Coach Gray for your faith in these young women and all you do for womens’ sports. You are my hero!!! Happy New Year—Love, Hugs and Peace too all! Hard to believe we are at the start of another decade. Where did all the years go? Weren’t we just celebrating Y2K? Kids that were 10 and Build-A-Bear Guests in 2000 are now almost 20 and by the next decade will be parents of new BABW Guests but let’s not rush it. There is so much to savor in our lives as they are today let alone how they will be in the future. Our staff had a lot of fun this past Christmas helping out Santa. When he asked us to be his Workshop in the mall we were scared but honored and we didn’t let him down. He was very excited we were able to bring Alvin and the Chipmunks because it was high on kids list this year. In fact they were so popular we are bringing them back for Easter and this time we will have a make your own Brittany the Chipette. She has become so popular! Right after Christmas we were able to introduce 35th Anniversary Hello Kitty and she too is quite the hit! I am BEARY hopeful that 2010 will be a much better year than 2009 for all. We are getting used to a new economy where we have to be more planful and spend more wisely. While everyone needs the hug of a soft, cuddly teddy bear we know the Moms of our Guests want a great experience and a great value and we are working hard to help her say YES to her kids as often as she can. Tomorrow we launch our first animal of the new year—BE MINE DALMATIAN!! He is quite the hunk if you ask me with his heart spots and sparkle heart dog tag. He has the cutest accessories and of course can deliver the PAWFECT message to someone you care for. The store is all set to WOW our Guests with our window of puppies. Our mailer arrives this week just when everyone needs a lift and a smile and it even has a special bearville gift and a great savings coupon for Mom. If you live in Canada we even have special Olympics merchandise and on January 22 we have the intro of ICarly bear! Our Guests have been asking and asking for Icarly and finally she will arrive. Things are really hopping on buildabearville.com. So many citizens and they all give us GREAT ideas and feedback to make it even more fun. The marketplace will finally open this Spring and I can bearly wait. Kids will love the shops they can open and hopefully they will love being in business for themselves in BABV! I hope to stay in touch more in 2010. Thanks for all your support and love and friendship. You are currently browsing the Maxine Clark's Blog blog archives for January, 2010.